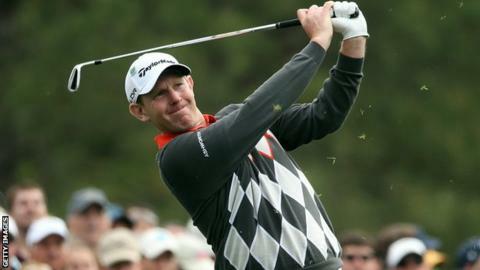 Stephen Gallacher is enjoying his debut taste of the Masters and believes the first major of the year is wide open. "I think anybody, on their day, can win this tournament," said the 39-year-old Scot. "You only need to see how many first time winners there are on the American and European Tours. "There is a phenomenal level out there just now. Youngsters are coming through almost equipped to win right away. "The favourites are all bunched up, so it's going to be very exciting." Defending champion Adam Scott is among the bookmakers' favourites, along with Rory McIlroy and three-time winner Phil Mickelson. Gallacher effectively secured his place in the field by successfully defending his Dubai Desert Classic title at the start of February, although a share of sixth place in the WGC-Cadillac Championship last month confirmed it. But four-time champion Tigers Woods will miss out for the first time in his career after having surgery on a pinched nerve in his back. "It's a shame Tiger's not here," said Gallacher. "You want the world number one playing." Experiencing the perfectly manicured course for the first time, Gallacher has played practice rounds with former winners Sandy Lyle and Jose Maria Olazabal at Augusta National. And he will partner Darren Clarke and Nick Watney when he tees off on Thursday. "The course is set up perfectly and the rain will make it a little softer for now," he said. "It's even better than I thought it would be. Everything about the place is fantastic - the slopes, the greens, the mystique..."
Only three players have won the famous Green Jacket at the first time of asking. Horton Smith and Gene Sarazen did so in the first tournaments (1934 and 1935), while Fuzzy Zoeller triumphed in 1979. "To get into this tournament you need to be playing well," continued Gallacher, who leapt up the rankings by successfully defending his Dubai Desert Classic title in February. "All the golfing greats have won here, so to be part of that club would be phenomenal. "But I've no expectations. I just want to enjoy the week, play well and see what happens."